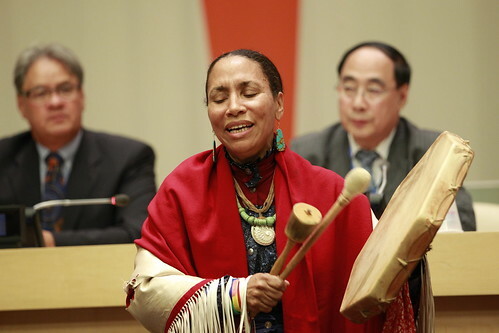 The UN marked the International Day of the World’s Indigenous Peoples (9 August), at an event held at UN headquarters on the theme, “Bridging the gap: implementing the rights of indigenous peoples”. The commemoration was co-organized by the Secretariat of the Permanent Forum on Indigenous Issues, Division for Social Policy and Development, Department of Economic and Social Affairs; the Department of Public Information; and the NGO Committee on the International Decade of the World’s Indigenous Peoples. Joan Henry, Tsalagi Traditional Song-Carrier Elisi, Nuyagi Keetoowah Society, performs a welcoming song at the event as Grand Chief Edward John (left), Vice-Chairperson of the UN Permanent Forum on Indigenous Issues; and Wu Hongbo, Under-Secretary-General for Economic and Social Affairs and Coordinator of the Second International Decade of the World's Indigenous Peoples, look on.